Throughout their run on The Flash, Francis Manapul and Brian Buccellato have hidden little gems along the way…little hints of things to come. The payoffs have been excellent throughout – and this issue of The Flash…uh, Reverse Flash is a great example. There are payoffs in this issue for things that have been simmering since the beginning of the series. After reading this, all I could do was simply say, “Wow!” So, let’s take a look at the origin of the New 52 Reverse Flash! Daniel and Iris West had a very troubled childhood. Their mother died in childbirth with Daniel, and their father has become increasingly abusive as Daniel and Iris grow up. Iris became driven to succeed in spite of her circumstances…but Daniel took another path, one headed straight for trouble. If anyone ever wanted to be able to turn back the clock, Daniel West is that person…but what he wants to do with that trip back in time is disturbing. The way he gets his power will have you scrambling for back issues, and it will make that uniform make perfect sense. And, that’s not the only thing that will have you digging into those back issues…but that’s too spoilerish, so go and grab this issue for yourself, ok? Just a note here – one of the big risks taken in the New 52 run of the Flash was the revision of the Reverse Flash. This was a complete departure from prior canon, so there was a lot riding on how this character turned out. Just my personal verdict here, but to me M&B have knocked this character out of the park. This new Reverse Flash is a very powerful foe, with a backstory that is just as powerful. He has been effectively tied in to the history of the New 52 Flash, and seeing how so many hints along the way have paid off in this issue is truly impressive. Manapul and Buccellato provided the script here, with pencils/inks by Scott Hepburn and colors by Buccellato. Hepburn does a very credible job with the artwork here, and the issue overall was one of the very best of Villains Month so far. This looks like the guidebook for future writers when it comes to the Reverse Flash – don’t miss this issue! This entry was posted in Reviews and tagged Brian Buccellato, Francis Manapul, Reverse Flash, Scott Hepburn, Villains Month on September 11, 2013 by Ed Garrett. I wish they would take those attributes and work them over to Danny, who I think has the best costume design and I think those armor chunks give him the coolest power set of the Reverses. I liked this issue a whole lot, made me appreciate the changes to the character but I really wish there was a bit more action. Am i the only one even slightly disturbed that a creative team (whom I otherwise really liked) took the time to create the background for a new villain and then….left? I’m saying that if they weren’t planning to stick around, it would have been….politer….to let the *next* creative team who would be doing future action with Reverse Flash issues do the creating of that character and his/her background. I was a little confused in this issue. What exactly are Danny’s powers? He can go backward in time? But then he can also run really fast. And he has a Venom-like monorail bonded to his body. I know it’s comics, so I don’t expect a completely logical explanation, but it seemed a little weird. He only acknowledged that his power was going back in time. You’d think he would be pumped about getting to run pretty fast. Can he also go forward in time? And why does he get all three of those powers? Seems like Barry is missing out with only the speed thing. While not a bad story, it wasn’t to my tastes, mainly because of the chage in continuity and what that means for Wally. Still, I’ll give issue 24 a shot. Indeed. Now that they’ve shown us the whole West family, there’s no longer any room for Iris to have a nephew at all, unless he’s five years old and Daniel didn’t know about him. There’s the time travel aspect though. With that now established, they might introduce Wally at any age, under pretense that Daniel *will* father an illegitimate child in the past. Added bonus: built in explanation for Wally having superspeed. In general, I view this as a step forward for Wally West. 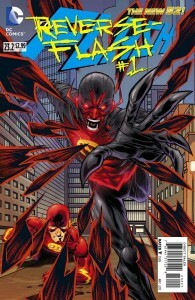 “Superspeed-villain father” gives Wally a unique hook to be explored — unique to the Flash universe, and unique to the character’s history. Put another way, there’s now a concrete storytelling reason to bring back Wally West. It is possible that Iris and Daniel have a significantly older brother who was already out of the house when Daniel was born. Since Iris is in her twenties now, she would need a much older brother in order to have a 15 year old nephew, or even a nephew near her own age. I am also rather partial to the idea that Wally could be her half-brother in the DCnU. For sure possible, especially since Wally’s father was a Rudy not a Danny. Plus there’s a large age gap. Daniel and Iris are only in their early twenties, whereas their father is an “old man” in a nursing home. So the timeline is accommodating. He might have had a previous marriage, for example. I just assumed that they intentionally made Iris and Daniel’s father an old man to leave room for a sibling who’s 10-15 years older. About to read this one…. I like thematically linking the Reverse Flash to the mirror universe. Great issue. Two weeks ago I complained the reveal lacked “Ah ha.” Wellll I was hasty. The explanation behind Danny’s transformation is an Ah ha work of art. Every element had been set up previously, and put together it makes perfect sense — yet I didn’t see any of it coming. By definition, a ha! I really like Danny as a character too. He’s more of an everyman (psychotic archnemesis) as compared to Thawne, which seems more appropriate for Barry. Also, I like how the flashbacks are in reverse chronological order. Pretty clever. Well, it’s definitely easier to translate to screen than the classic psycho science professor from the future, and it keeps all the best elements of the original Reverse Flash, namely the obsessive behavior, murderous tendencies, the fixation on Iris, and the ability to travel backwards in time. The obvious downside to this version is losing Wally West in the process. It was cool, but I like the time travelling Professor Thawne better.